"Guess who's coming for dinner?" I said to Susan. Actually, I didn't. But I could have. Bob's Spot messenger trail was heading straight for us faster than I could have imagined. I checked with Susan and headed to the grocery store to pick up a few essentials we needed if we were to take good care of our incoming guests. Mere minutes after walking in the door I spotted motorcycles in the driveway. Bob and Karen were weary from a long day's ride in foul stormy weather. 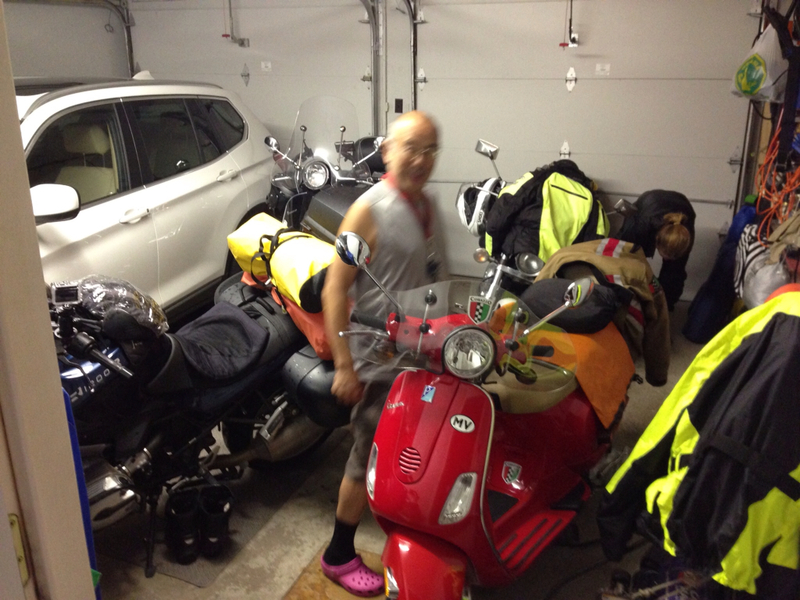 They wheeled their bikes into the garage and lost no time shedding all the wet armor. A hot home cooked meal, following nice hot showers, with a couple of bottles of rosé and white wine, led to a very pleasant evening of conversation. After breakfast on Friday morning Karen had to leave for home. Bob and I rode out to the western tip of the island to see her off. It was a last ride for the three of us together. Bob planned to stay with us for the weekend before heading out for his own long trek home to Vancouver. Last year in Vancouver Bob had given me a grand tour of his favorite haunts. Bob, Sonja, Roland, and Dave were wonderful tour guides. Now it was time for me to return the favour, if only for Bob. I had a day to give Bob a decent lesson in the sights, sounds and tastes of the city. It was fun to be leading a tour. The fact that we had Sena helmet communicators made a huge difference. Before treating you to the tour we took, I should add a technical note on the Sena. Bob mentioned that he was getting some static on his. Later during the tour he could hear me, but I couldn't hear him. After some trial and error, we disconnect and re-seated both our control units. Bingo! Problem solved. It seemed that Bob's unit was not quite seated well and one of the pins (presumably the pin or pins for the mic) had made a poor contact. We took the shortest and fastest route to the easternmost point on the tour. 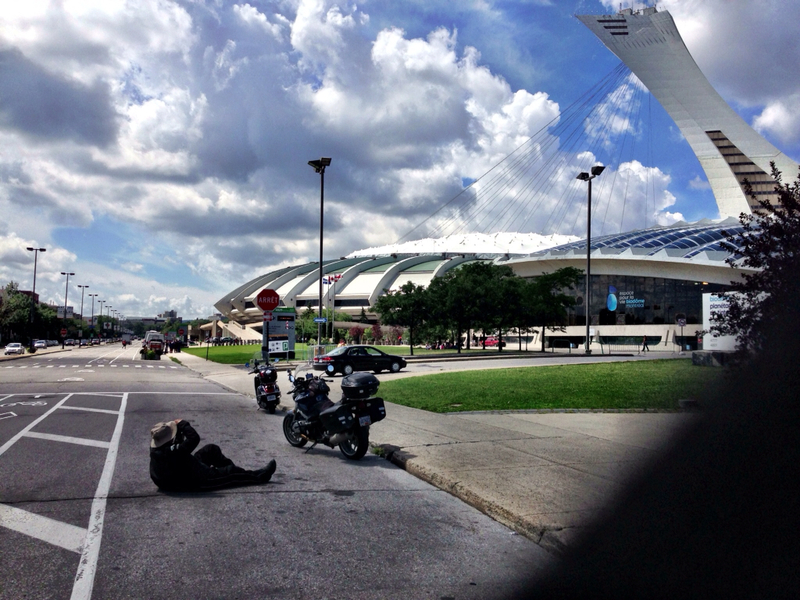 The Olympic stadium and the Olympic park. The stadium has become one of Montreal's signature landmarks. You can see it from afar from all over, or at least from anywhere but the western side of the island since Mount Royal gets in the way. Unless you see it from close up it's impossible to grasp the scale of this huge building. I decided that I would take pictures of Bob taking pictures. From there I set a course for Ste-Helen's Island. 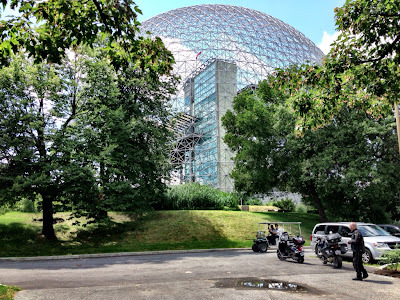 This is a must see as it's the former home of Expo67. 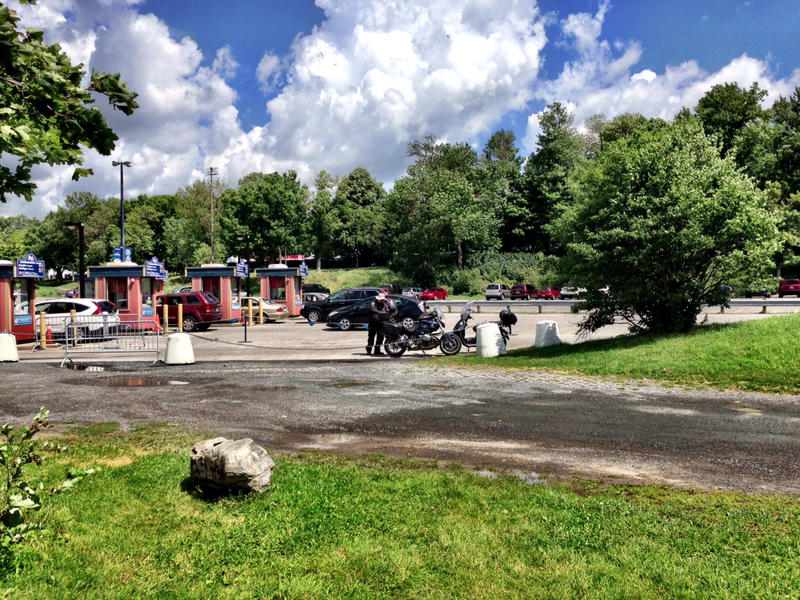 I chose the eastern access over the Jacques Cartier bridge. It's the most dramatic route to the Island and the bridge itself is another signature landmark. The first photo op was what is now the Biodome and what was the Expo67 American pavilion. I had my fingers crossed. 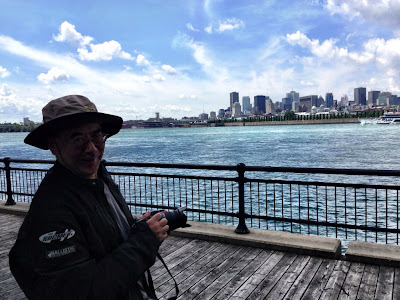 We took a short ride across a bridge onto the site's man-made sister Island, Ile Notre Dame. You see, Bob is not only a rider and a talented photographer, he's also a true car guy. I guess the finger-crossing worked, because Circuit Gilles Villeneuve, site of the one of the world's 19 Grand Prix F1 races for the 2013 season, was open to roller bladers, cyclists, and... yes, motor vehicles. The thirty kilometer per hour speed limit didn't allow for any knee-down Moto GP antics, but it's still pretty cool to ride an F1 race track and see it from that perspective. Returning to Ile Ste-Hélène, we cruised along as I pointed out other Expo67 pavilions that still stand, some of which house the Montreal casino. We tucked the bikes into a niche near the La Ronde amusement park and walked a few feet to a spot that offers a great view of the city. From there we took the Pont de la Concorde towards the old port and Old Montreal. We parked the bikes opposite the Marché Bonsecours and took a stroll along rue St-Paul, past Place Jacques Cartier, then up to Notre Dame street, back down through Place Jacques Cartier, before returning to fetch the bikes. Once we saddled up, we headed back up to Notre Dame and westward to St-Laurent boulevard. 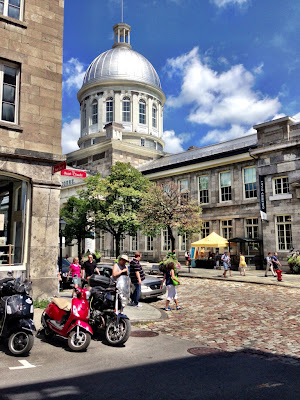 I was constantly doing my tour guide impression, reeling off all the information about Montreal that sprang to mind as we made our way northbound on 'the Main'. St-Laurent divides Montreal east and west. It's also been the traditional focal point for successive waves of immigrant families. Like an archeological dig, the waves of immigration defined the Main south to north. We travelled through Chinatown, then through the entertainment district, and parked the bikes just north of Pine avenue in the stretch where the Jewish influence is clearly present. Schwartz's Deli sits on the eastern (sunny) side of St-Laurent just fifteen or twenty feet north of our parking spot. We lined up long enough for Bob to snap some photos, of this most iconic of Montreal eateries. Unwilling to devote half an hour just to make our way to the door, I mentioned to Bob that the Main Deli across the street had excellent smoked meat, and was certainly ranked in the top five Montreal smoked meat establishments. So we settled in there for the obligatory 'special': a delicious smoked meat sandwich with a kosher dill pickle, some cole slaw, and a side of french fries. There were still some obligatory stops and it was already three o'clock. We hopped back on the bikes and headed further north up to Mount Royal boulevard where we turned left and headed straight uphill to where the Camilien Houde Parkway winds its way up Mount Royal in a series of switchbacks. At the summit we circled back and headed back on our path so that we get to the eastern lookout. We chatted, snapped photos along with the usual tourist crowd. 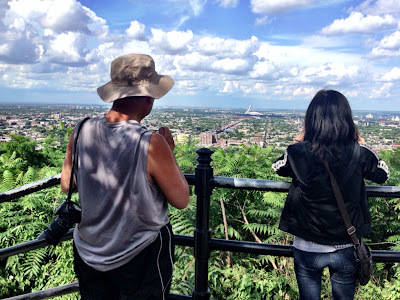 The most prominent landmark to be seen from this vantage point is the Olympic Stadium, far away to the east. Truth be told, we dared to become scofflaws and made an illegal left turn to head back up to the summit. We followed Remembrance Road down the northwest side of the mountain, then left on Cote des Neiges, and immediately swung a hard right to climb up the other switchback road towards the Westmount summit. 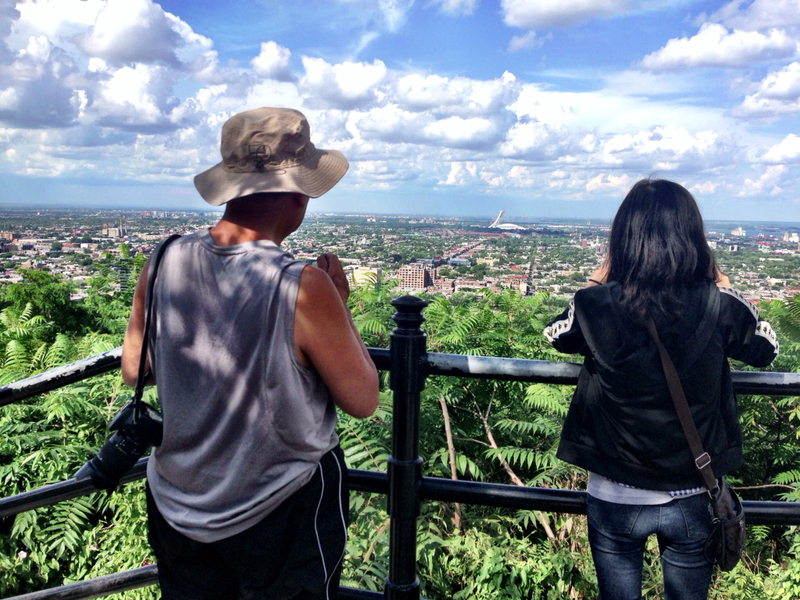 Our destination was the Westmount lookout. 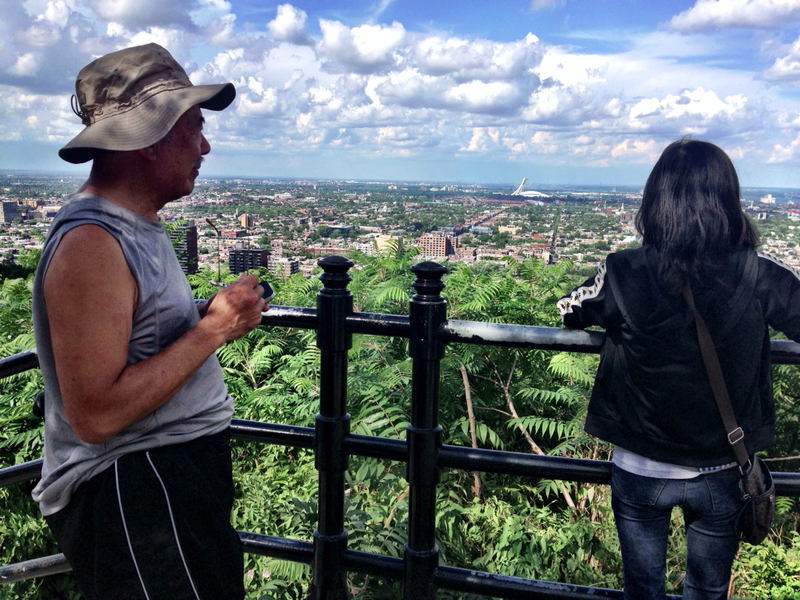 Not many tourists know about this third Mount Royal overlook. Since it's nestled in among the priciest homes in Montreal it's off limits to tour buses and off the radar for most tourists. After taking in the sights looking southwest over the city, we rode down to the downtown core. We joined the parade of cars headed east on Ste-Catherine Street. 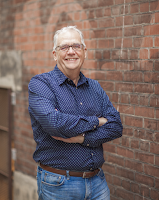 I was planning to park the bikes on McGill College avenue and take a stroll to show Bob the Roddick gates to the McGill University campus and the plaza at Place Ville Marie at the opposite end of the avenue. That plan was pre-empted because the avenue was closed to traffic for some kind of street festival. It was getting late. I had exhausted my tour itinerary and I had a hair appointment at 7:00 o'clock I really needed to keep. We took the expressway home. I had made no plans whatsoever for the evening. After a rather late dinner, it was Susan's turn to step into the tour guide's shoes. She proposed driving into town, stopping to give Bob a taste of a Montreal orange julep at the giant Orange Julep drive in on Décarie boulevard, a Montreal hangout celebrating its 80th anniversary. From there she proposed heading to Mount Royal to hike over to the third and most attractive lookout that is only accessible on foot. Truly great suggestions. 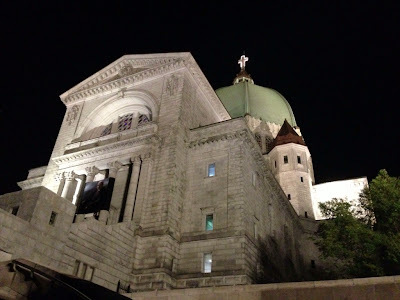 On the way we digressed slightly to take in St-Joseph's Oratory. To call it a church is like calling St-Peter's in Rome a church. It is one of the most prominent landmarks on the north side of the mountain. From there we went to the main lookout that provides the best views of the city. Bob took some amazing pictures of the skyline. By the time we were done, Susan had one last great suggestion: let's take Bob for a Montreal bagel at St-Viateur Bagel. It was very late and more than high time to call it a day. Part two of this story starts here. Wow, you guys did pack a lot into one day. It looks wonderful. like that you were taking pictures of Bob taking pictures. When there's a lot going on, it takes longer to put together a decent blog post than it does to do the thing that deserved the post. I'm still dealing with a backlog (ha! pun alert) of blogworthy stuff resulting from the Blogger to Blogger extravaganza. Thankfully these things don't happen that often. 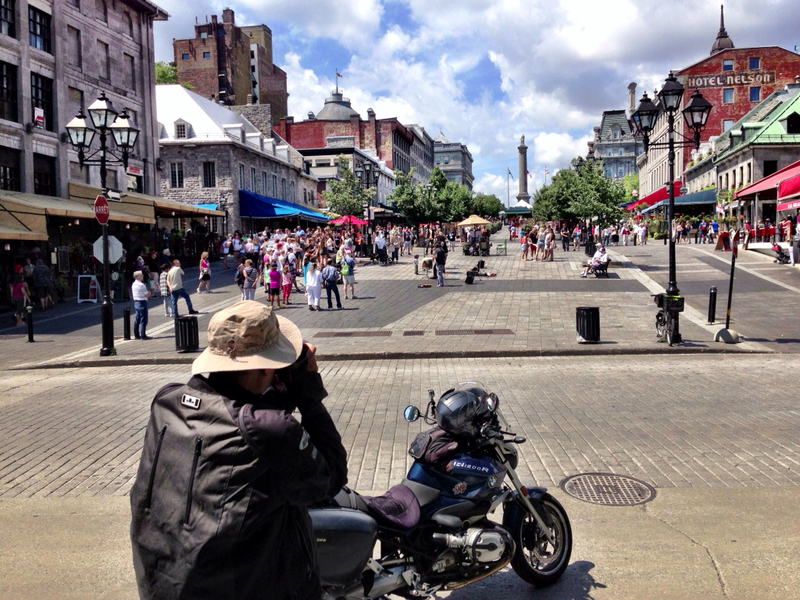 Nice whirlwind tour of Montreal, it looks like a wonderful mix of old and new. I like the giant orange but it feels like there should be car-hop service. Now where would they hang the tray on a Vespa or BMW. Third attempt at leaving a comment. Isn't Blogger fun? 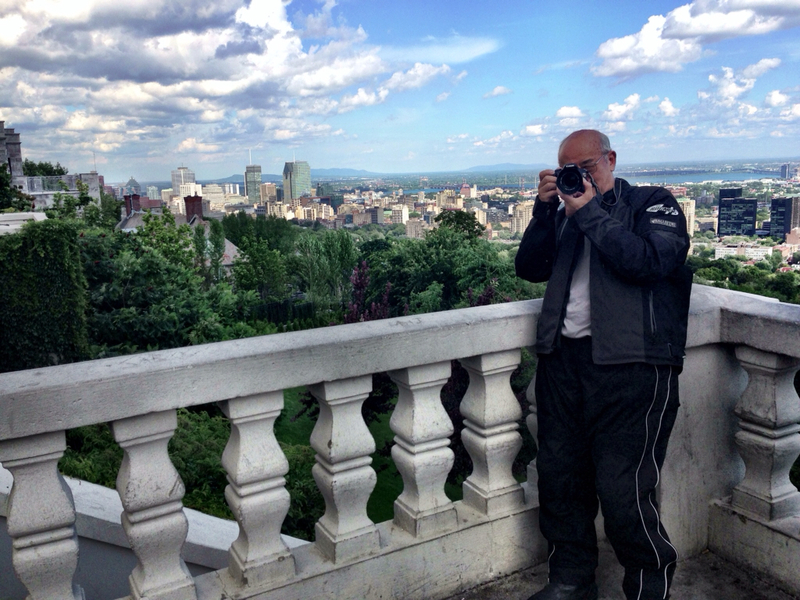 Thanks you for taking us along on your tour of Montreal, another one of those cities that I'd like to visit. I like the giant orange. Richard, OJ did have roller-skating waitresses and window trays back in the 50's and 60's. It's a real genuine throwback and one of Montreal's signature landmarks. Thanks again for you hospitality. PS Bob - those were amazing nighttime skyline shots! Yeah, it seems you're having way too much fun. Great pictures too! Nice vicarious tour....would love to have been there in person! I love Montreal and hope to be able to visit again some time in the not so far away future. Dave, we certainly did our level best to tucker Bob out. Bear in mind I was only returning the favor. When I was his victim in Vancouver he texted me before 6:00 a.m. to kick off my Saturday tour, and that was after the Friday tour that wrapped at midnight. Basically we're talking payback. Karen it was a pleasure having you as our guest. I look forward to other opportunities to ride together. Steve, if it's possible to have too much fun, then we certainly did. I learned a lot on the tour about moto-hospitality from you and Paul, and the other bloggers we were privileged to meet. The whole experience was simply amazing. Bob yes you may well have gained dome weight, and lost some sleep. That was the Plan. Mission accomplished. Sonja, you and Roland have a standing invitation. I'm dropping hints that Bob should plan a Can-Am-Euro Blogger to Blogger Tour. If he does, it will surely happen. Maybe Provence and the Cote d'Azure? Tuscany? Costa Brava? Richard, I found the missing comments in the spam filter. Hopefully restoring them solves the problem.